Maintenance is key if you want something to last long. Whether it’s a car, a guitar, or a heating unit, regular inspections have to be considered to remedy existing problems and prevent them from escalating. The same applies to your roofing system. If you don’t want to spend thousands of dollars repairing roof damages that could’ve been prevented, contacting a reliable roofer from Chicago early on is always a good idea. Roof maintenance, however, should not be reactive. You may have recently installed a new roofing system but it doesn’t mean that you should wait five more years before calling a professional to have it inspected. Homeowners should always follow a proactive approach when it comes to dealing with roofing systems. 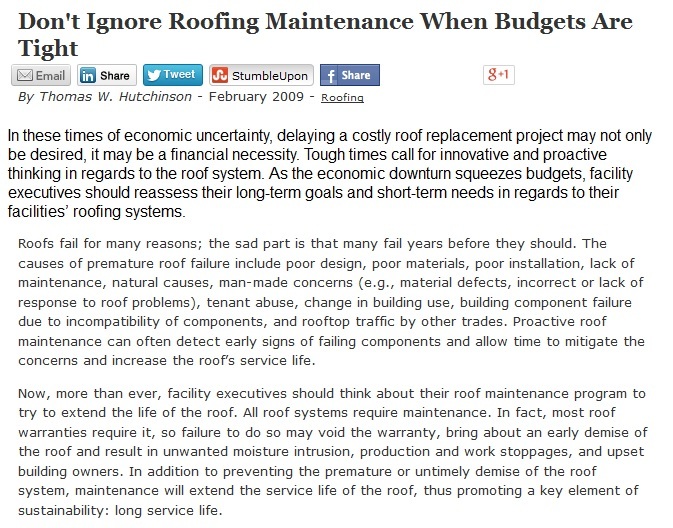 All roof systems require maintenance. In fact, most roof warranties require it, so failure to do so may void the warranty, bring about an early demise of the roof and result in unwanted moisture intrusion, production and work stoppages, and upset building owners. In addition to preventing the premature or untimely demise of the roof system, maintenance will extend the service life of the roof, thus promoting a key element of sustainability: long service life. When a professional like Rogers Roofing, Inc. inspects your roof, the best solution will be applied based on the state of your roof. A maintenance round usually includes the repair of chimney flashings, the replacement of damaged or missing tiles, and the removal of debris. Roof maintenance will include recommendation on roof replacement, if necessary. Your reliable Chicago or Orland Park IL roofing contractor will inspect your roof and look for potential problems, such as curling, rotting wood, or algae growth. Depending on the evaluation, you may need a new roofing system installed, or you may simply need a quick fix to the problem; either way, addressing the damage can save you a lot of money in the long run. Doing it yourself is never an option because being on the roof can be dangerous, especially if the weather is uncooperative. Only an experienced and reputable roofer can take on a treacherous task. Moreover, a professional can provide an immediate solution without having to wait for the next weather disaster to plague your area.